What Are The Chances (Risk) Of Miscarriage By Week? What is the risk of miscarriage by week? They range anywhere from 9.4% at 6 weeks to under 1% at 14 weeks. The variability on the chance of miscarriage is high because it depends on many factors unique to the individual. It’s also difficult to get an exact measurement of the chance of miscarriage because there is a lack of research on many of the factors that go into a miscarriage. Nonetheless, let’s take a look at what data there is on the risk of miscarriage, which declines as the weeks progress. The risk of miscarriage is influenced by things like the week of pregnancy, whether or not a heartbeat has been detected, the fetus’s heart rate, the father’s age, the mother’s age, and the prior number of miscarriages a woman has had. The time of the pregnancy is one of the variables most closely correlated with the risk of miscarriage. The risk decreases as the time of the pregnancy increases, with the highest risk being the first trimester. Whether or not a heartbeat has been detected is also fairly tightly correlated with miscarriage risk. 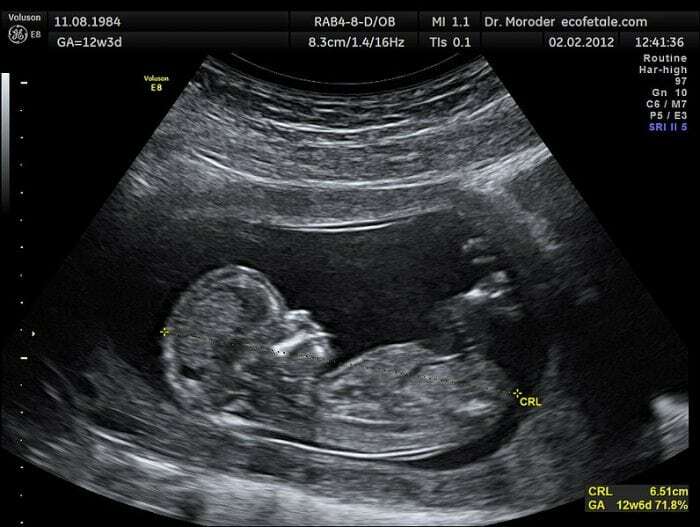 Most women do not receive an ultrasound that will confirm a heartbeat until around 8 to 10 weeks into the pregnancy. In the first 8 to 10 weeks, miscarriage risk was approximately 45% in the sixth week, and around 2.5% in the seventh week, according to one study. The fetus’s heart rate is an important variable to consider when predicting the likelihood of miscarriage. A fetal heart rate which is too slow can be indicative of a coming miscarriage. One study found that the chance of miscarriage in the first trimester has a notable correlation with the fetus’s heart rate, with a higher miscarriage risk the lower the heart rate. A fetal heart rate changes with the age of the fetus, so the target values change as the pregnancy time increases. Approximately 64% of fetuses with a heart rate between 80 to 89 were miscarried. Approximately 32% of fetuses with a heart rate between 90 to 99 were miscarried. 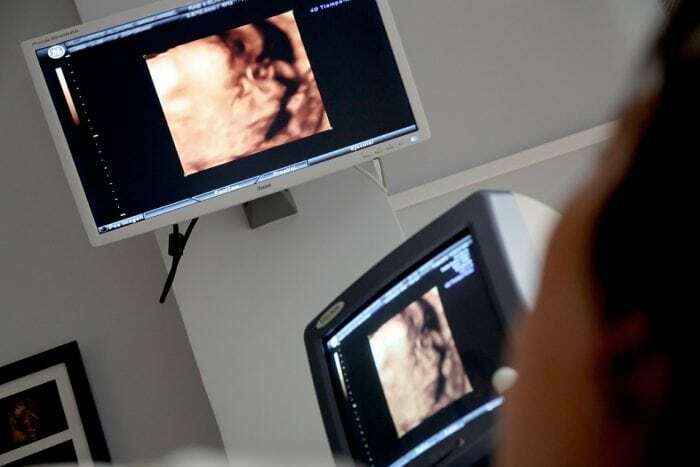 11% of fetuses with a heart rate greater than 100 were miscarried. The miscarriage rate was 43% for fetuses with a heart rate of between 101 to 109. 18% for fetuses with a heart rate of between 110 to 119, and 6.5% for fetuses with a heart rate of greater than 120. Almost every ongoing pregnancy had a fetal heart rate above 120 bpm after the seven-week mark. Age of the parents also influences the risk of miscarriage. While the age of the woman is a well-known factor influencing the risk of miscarriage, the age of the man also matters. In general, miscarriage rates tend to climb for women conceiving after their late 30s, and miscarriage rates see a notable increase in men who father after they turn 40. A large-scale study done on the relationship between miscarriage and age (which included the largest population ever studied for such a topic), tracks every possible outcome of reproduction: birth, miscarriage, stillbirth, or abortion. This study, which tracked the outcomes of upwards of 1 million pregnancies found that a woman’s miscarriage risk increases dramatically during her late 30s and is almost 100% by the age of 45. Rates of stillbirth and ectopic pregnancies also saw a similar increase. Although, while the risk factor increased dramatically as a percentage, a woman’s overall risk of stillbirth remains under 1% throughout her mid-40s. Researching the effect of a male’s age on pregnancy proves to be difficult because most women conceive with men who are for approximately their own age. For this reason, researchers have difficulty isolating the effects of the man’s age from the women’s age. Yet several studies have successfully done so, and have found that the age of the male also influences miscarriage risk. The older a man he is, the more likely there is to be a miscarriage. However, the effect is not pronounced until approximately a male’s mid-30s. One study found that for males over the age of 35, the risk of miscarriage increased by approximately 25%, while another study found that for those who were over the age of 40 the risk of miscarriage was increased by approximately 60%. Since the age of both parents influences the risk of miscarriage, a younger partner can offset the risk of miscarriage somewhat. This is especially true for males in their mid-30-40s. If their partner is under 30, the chance of miscarriage will be pretty low. Unfortunately, for women, a younger partner only somewhat reduces the risk of miscarriage. According to a large-scale study, women who were over the age of 35, yet had a fairly young partner still saw almost double or triple the odds of miscarriage as women in her 20s did. If both partners are older, the risk is compounded. A woman who is in her 30s, with a partner over the age of 40, has approximately triple the odds of miscarriage when compared to a woman who has a partner also in their 30s or younger than that. The number of prior miscarriages a woman has had will also increase their chance for future miscarriages. However, the effect seems to be weak until a woman has had three miscarriages or more. A large-scale study that examined over 1 million pregnancies found that risk of miscarriage was approximately the same for women who have had fewer than three miscarriages. Although, women who have had three miscarriages or more do see a moderately increased risk for another miscarriage. Now that we have examined the effect of other variables on miscarriage risk, let’s take a look at how miscarriage risk evolves over the timeline of a pregnancy, as influenced by these other risk factors. A woman’s overall risk of having a miscarriage drops as the timeline of the pregnancy goes on. There is a substantial drop in risk around the 7th week of the pregnancy, followed by another substantial drop around the 12th week of the pregnancy. At around 6 weeks in the pregnancy, with a confirmed fetal heartbeat, there is an average miscarriage risk of around 9.4% At 7 weeks this is about 4.6%, at 8 weeks the risk is about 1.%, at 9 weeks the risk is about 0.5%. By the 14th week, a woman’s average chance of having a miscarriage is less than 1%. A woman’s risk of having a miscarriage is influenced by multiple factors, such as her age, the age of her partner, and her prior number of miscarriages. In terms of age, risk of miscarriage increases notably for women over the age of 37 and it also increases substantially if the woman’s partner is over 40. One of the biggest influences on miscarriage risk is how far along in the pregnancy the woman is. Risk for miscarriage decreases as the timeline of the pregnancy goes on.